Woodstock, VT: Skylight Paths Publishing, 2003. My first encounter with the Eastern Orthodox Church was in college. Up until that point I hadn’t even realized that there was something else besides Catholics and Protestants in Christendom. In Abilene, where I studied, there was a billboard that said, “Come to St. Luke’s Orthodox Church, the real first-century church!” It was a little good-humored slant at the churches of Christ who also claim to have embodied the church of the New Testament. I went one Saturday evening to the “Vespers” service and fell in love a little bit (a crush, as it were). Eastern Orthodoxy is on the ‘high’ end of “high church” and in some ways filled a great religious void in my life. As the sign implied, it was indeed a natural extension of a good deal of the foundational ideas of my own tradition. Unfortunately, it also embodied some of the worst qualities of my tradition, especially its hard-lined exclusivity. I soon became a scorned lover. I have not fallen quite out of love with that church. Theologically it has been a well that I continue to draw from, and it has shaped my thoughts and actions in important ways. When I came across this book at a bookstore I knew it was something I needed to read: another outsider (this time a Roman Catholic monk) visiting the place Orthodox Christians consider to be holiest: Mt. Athos. I picked it up as a way of learning more about this very special place—a place I am not likely to ever be able to visit in person. I quickly found out that this was not just a book of interesting mysteries, it was a book for devotion, a book that called me to prayer, to rest, to contemplation, to peace. This is (…was…) the private journal of a “hieromonk” (priest/monk) named M. Basil Pennington. He was a monk of the Trappist order, an order known for a fairly consuming prayer schedule and a restriction of speech—like an “almost” vow of silence. Pennington is one of the “higher ups” of his order. When he was called to a new set of responsibilities he had the opportunity to take a ‘retreat’. He chose Mt. 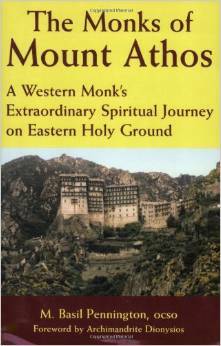 Athos, a narrow, mountainous body of land that juts off the coast of Greece, close to Thassaloniki (Just Google it). The Orthodox Church has claimed it as the center of its spiritual life. There are a good number of monasteries there—each with its own distinct style, rule of life, and community. The journal tracks Pennington’s private thoughts throughout his retreat. The entries range from personal introspection and examination, to reflection on the days events, to a narrative of the events he encountered and conversations he had. In eulogizing the late Pennington, someone said that if one wanted to learn Pennington’s true character, of his deep love and grace, he should simply read this book. That is certainly true. The self-emptying love of God is embedded deep within Pennington’s thoughts. It is really a pleasure to be able to experience what is, in some ways, the height of Christian community between people who have devoted themselves wholesale to God. A major theme is the ecumenical question: how will a group that is religiously exclusive entertain an outsider? Through the course of the book the answer varies. Pennington discovers that each monastery is different. The place where he spends most of his time, Simonos Petras (Simon Peter) is full of monks who embrace him. Others are less enthusiastic about his presence, but every monastery and hermitage he visits—with the exception of one, a monastery that has since been deemed heretical by the Ecumenical Patriarch (the equivalent of the Pope in the West) of the Orthodox Church—treat him with dignity, respect, and hospitality. This is not to say that everything is always wonderful. One of the most poignant parts of the journal is when Pennington reflects on the ways in which, even in his home base of Simonos Petras, he faces the inevitable wounds of exclusivity. Some of the older monks openly wonder why he has yet to “become a Christian” (meaning that he is not Orthodox), while some of the younger ones tend to try to convert him, subverting any real relationship that might occur. He is often asked to stand in a separate place reserved for non-Orthodox in the worship services. Anyone who has spent any time with the Orthodox church knows these wounds. It is so difficult to be with people who represent a tradition that has so much of God in it, a tradition which you consider yourself one with as a Christian, and yet for them to either reject your aspirations or at least to consider themselves somewhat above and beyond what you bring to the table as a Christian. Several other themes run through this book, from Pennington’s frustrated desire to be able to be more present in the moment, or his humble reflections of his own insufficiency and failures, or his rich and deep insights into the Christian life in general and the life of prayer in particular. This book is a modern-day spiritual classic, but what makes it a classic is not just the quality of its prose or vitality of its rhetoric, but rather the way that it is itself a call to prayer, a summoning and kindling of the heart that compels one to seek and find God.